Leading Herbal Medicines Manufacturers in India – North India Life Sciences Private Limited is a leading GMP approved herbal medicines manufacturers & suppliers in India. The company has well-renowned for high-quality herbal formulation, unique monopoly marketing strategies and on-time delivery policy. North India Life Sciences boast of a huge network of franchise partners support across the world due to our quality centric approach and all this at very affordable prices. We are the well-known herbal medicines manufacturers in Karnal, Haryana (India). Our high-quality supplements are renowned for pure and natural ingredients which help us to attain the attention of some herbal products manufacturing companies to fulfill the requirement of the herbal industry. All of our supplements undergo a thorough process of manufacturing formulations which benefit on the great level to the body, mind, and emotions of the patients. Apart from this, we take care of the fastest delivery process with a very short span of time. We always manufacture the medicines by keeping in mind the secure and healthy treatment of people. Our laboratory specialists always test the drug in the lab to check the quality of ingredients and healing intensity of the medicines. Herbal Medicines Suppliers in India | North India Life Sciences Private Limited! Herbal Medicines Suppliers – At North India Life Sciences (Top Herbal Medicines Suppliers in India), we have employed highly-skilled and experienced researchers and experts who have years of expertise in the selection, preparation and formulation of ingredients to produce best herbal supplements for restoring health and balance. In India, the traditional Ayurveda expertise and knowledge have been traditionally preserved from generations to generations for thousands of years. As the reputed herbal medicines suppliers, we supply our products to the distributors across India, and they further deliver these products to the retailers and wholesalers to reach the consumer market. We have own gardens and farms and follow a sustainable and organic procedure of farming and harvesting. North India Life Sciences Private Limited is one of the most growing herbal products manufacturers throughout the country. Conferring the herbal products to the layman with an appreciable quality is the only aim for our team of goers. Along with our customers, we are well known in delivering the best products to our other companions dealing with Ayurvedic herbal products throughout the country. The top herbal products manufacturers in India are performing as the leader brand in herbal medicines for many years to serve the humanity with safe and best medicines. Our herbal products manufacturing plant/unit is the place where we generate a vast range of herbal medicines to cure the disease from the root. Manufacturing process of North India Life Sciences Private Limited basically is a combination of several quality processes which ensure the quality and credibility of our production. You can simply rely on the best herbal products manufacturers in India. In addition, herbal supplements by us are widely used to treat many health problems such as skin infections, eczema, asthma, migraine, arthritis, chronic fatigue, and premenstrual syndrome. Herbal supplements are popularly known as an effective remedy to cure cancer and kidney diseases. As per the various research reports, it has found that 90 percent people use herbs to get relief from arthritis and chronic urinary diseases also. Therefore herbal products are also widely employed in the treatment of worst health conditions of a patient. The production of manufacturing the products at our herbal medicine manufacturing company goes through various quality tests. We have a team of professionals and medicines experts which raises an assurance that the end product will be provided with the expected and high quality. As we believe in bestowing the natural products so utilizing purity of nature is our expertise. North India Life Sciences embellish the quality of our medicines with the raw material taken by the freshness of nature as many of farmers are associated with us to serve the best herbs which further take place as the end product. Being a prevalent herbal medicine manufacturing company in India, it becomes our duty to endow the durable and sustainable medicines. North India Life Sciences is a top-notch herbal products company in India which engaged in herbal products/medicines manufacturing from its Karnal, Haryana based plant. 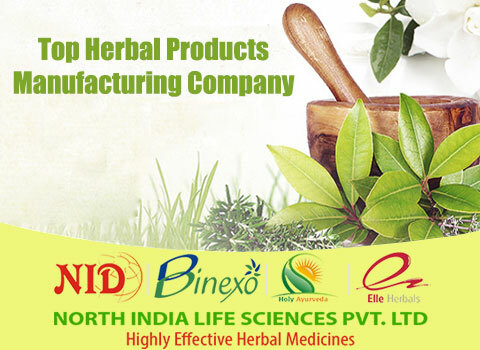 North India Life Sciences is a popular best GMP certified herbal products manufacturing company in India. Real-time efforts and dedication of our team of experts made us one of the best herbal medicines manufacturers in India. The quality of our products speaks for the evolvement of venture we are running for years. To serve every nook of our country with the best herbal medicines we have started a franchise program. We are offering the franchise to the candidates who have an aspiration to work with us and grow with us. Adding the best composition to the products while manufacturing is our routine task and this enhancement in the quality ensures the growth of our franchise owners. To be one of the proud herbal products manufacturing company, our aim is to deliver high-quality products to the patients. Herbal Products Manufacturing Company in India – The supply of the products will be rapid and unstoppable. Get the franchise offered by us and replicate your growth again and again. Be a part of the team of competent and dexterous people and polish your venture. In today’s era of fast and modern lifestyle, we are rapidly losing the immune power of body and holistically, consuming the strong medicines which can lead us to the harmful side effects. By keeping this in mind, North India Life Sciences have arrived with the safest herbal medicines to serve our customers better. Distributors who are associated with us are making a huge profit by having their own monopoly rights. You can expand your venture in your territory as much as you desire. Our cosmetic products contain skin healing properties, so these supplements are widely preferred by the people in the treatment of pimples, reducing skin blemishes, and for anti-aging treatment as well. These days, people are aware of the chemical reaction and side effects of the allopathic medicine, so they prefer to buy herbal products to get cured without getting any side effect on the body. We always take care of the production and manufacturing of the natural drugs, and we have own organic farms to grow herbal plants. Moreover, in the research and manufacturing lab of North India Life Sciences Pvt. Ltd., we have installed high-class advanced machinery which helps us to produce herbal medicines in bulk and enable us to fulfill the demand of our products on a large scale. Apart from the above, our primary objective is to deliver high-quality supplements on time at affordable prices so that every single person can enjoy a healthy life with us! To become a franchise of the best herbal products in India, we invite you to fill up the inquiry form or contact Mr. Anup Bhardwaj at +91-8685844444, +91-8950311000.